In Hush Boutique Spa, we offer a rich variety of facial treatments, body therapies, medi-spa therapies, laser hair removal, nails and whatever comes along with being beautiful and young. Our Skilled knowledgeable therapists will put your mind & body at ease with top-of-the-line services andbproducts, in a sensory space for men and women. My name is Froso Antoniou and I’m from Cyprus where I was born and raised. I’m the owner/founder and CEO of Hush Boutique Spa,Motivation Spa. I recently discovered how your life can change when you realise your life’s mission.I always was a person that whatever I had in mind I had to achieve. My life’s mission is to become a great influencer for good.Inspiring more and more people realise their true values and standards. I love spending quality time with my family in the park or the beach, paying with our dog, meeting and spending time with like minded people. I love what I do as a team leader in Hush and that reflects back to me from my Inspirational team and clients with lots of appreciation and gratitude. My goal as an owner of Hush is to continue giving the same and better quality of services and products and to keep that unique experience for every single one of our clients. We either growing or dieing so our goal is to franchise so more and more people will be able to experience the high quality and uniqueness of the Hush journey! I am Carmelita Payawal,38 years old from Philippines. Very proud of myself although I didn’t finished my college graduation but I managed to get 3 years secondary was actually 1 year accelerated from being working hard. heartful, hardworking and especially family oriented! I like doing things like cooking,singing,dancing and reading .Im very energetic person and love sports too. 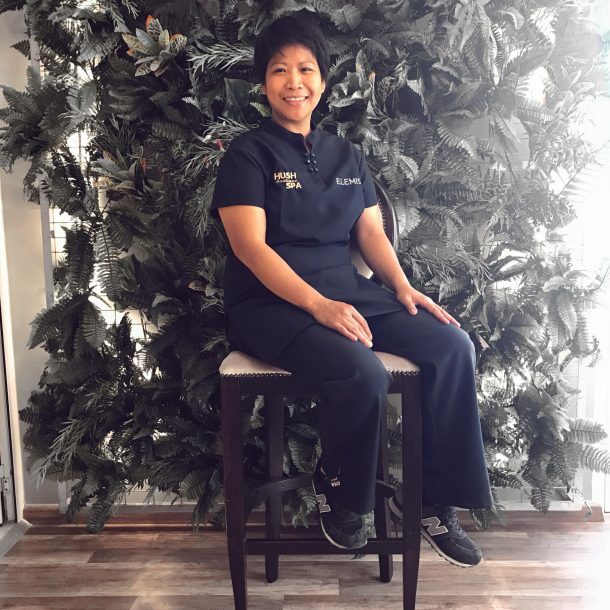 Its been 2 years and 6 months that I’m happily offering my services in Hush Boutique Spa and I would say that I’m very proud to be a professional Massage Therapist, expert in Spa treatments and Medical Pedicures. Here I found happiness because I felt love from people whom I helped and I’m thankful for this gift. My Goal in life is to help more people especially those who need me most.I ll never stop dreaming of expanding my talent and of course I am very willing to learn,teach and share my knowledge for being a Massage Expert.